Recap of FMC2 tournament, which took place on Saturday, December 30th at 2:00 PM CET. This RaiZo's deck had faced Y Rush 8 times in the tournament and lost only once! Y Rush is considered an unfavorable matchup for Y Tempo, but not when RaiZo "Rush Killer" is piloting it. Is it still Y Flyers if there are no Drakkar Skycaptains? Is it still Y Control if there are no Wind Soldiers? Interesting deck featuring forgotten Soul Pacts and universal Emperors Commands instead. Undefeated in round 2. S_t_0 put 2 Oradrim Fanatics and cut Scourgeflame Specter from conventional RY Burn. He switched his opening deck to this extra-mobile deck in the 3rd place match and had not regretted it. A Deck based on 2 rarely seen Oversky cards - Path to Paradise and Rakoan Chieftain. Skc, an established Faeria player, was caught by surprise in round 1 as he was steamrolled by BoBBiN's invention. No games ended with a result 3:2 in round 2. All games ended with a result 3:2 in round 3. Donpork has the "2nd place curse"
A lot of mid-range decks .. and mantas. This time seeding was random (to fasten up the start of the tournament which took a while as couple of players were missing sign-ins). 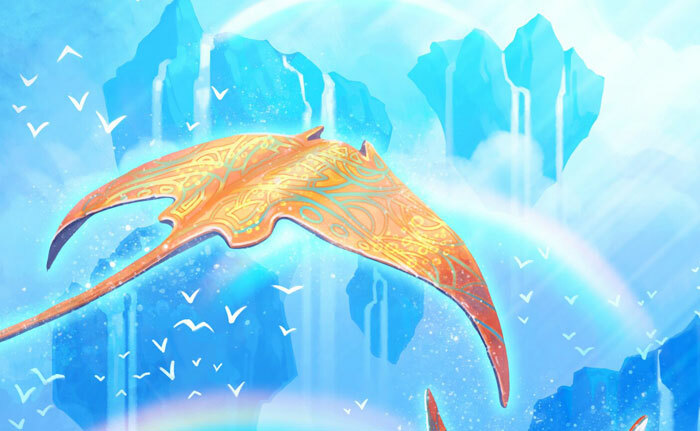 Faeria Manta Cup 3 on Battlefy. Seeding will be based on player rank (God rank position). Parallel "Tier-2" bracket (tournament) is a possibility.